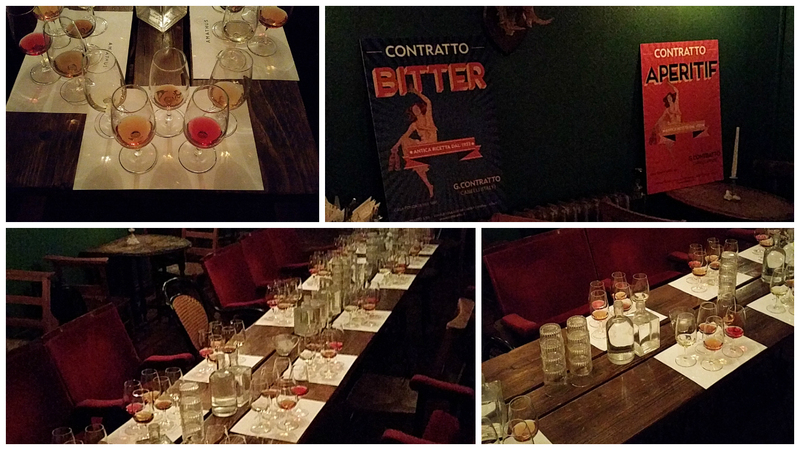 On Monday, 9th November, we spent the afternoon at Evans and Peel to host a Contratto masterclass and cocktail competition. If that wasn’t exciting enough, we were lucky to be joined by Anja Cramer, owner, with husband Giorgio, of Contratto distillery. Contratto was founded in 1867 by Giuseppe Contratto. The winery is known as the oldest producer of sparkling wine in Italy, in fact, the Metodo Classico 1919 Contratto Extra Brut was the first vintage sparkling wine ever made in the country. In 150 years of wine making, Contratto went from producing sparkling Moscato and red wine to still wines, vermouth, tonics and syrups. The winery is now owned by La Spinetta (a family run business) who acquired it in 2011. Since then they have reintroduced Contratto to the world and continued to preserve and uphold its 140-year-old tradition and top quality. 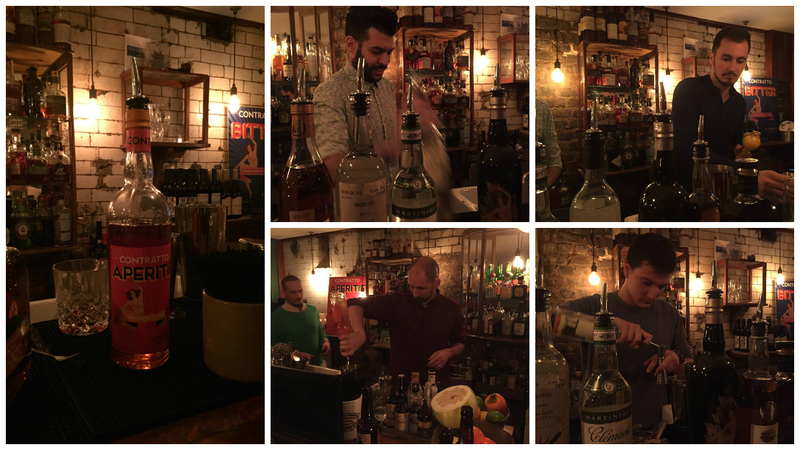 Evans and Peel isn’t like most bars you’ll find in London. It’s an underground, hidden cocktail bar located near Earl’s Court tube station. I don’t know whether you’ve been before, but it’s not the easiest place to find. After 10 minutes walking up and down the same street looking for a big sign saying ‘Evans and Peel’, which didn’t exist, I finally had to ask someone to point me in the right direction. I won’t spoil it for you, but this place is definitely worth a visit if you haven’t done so already! All I can say is, expect the unexpected! So the masterclass kick started at 2 o’clock and on tasting were 3 vermouths, Bianco, Rosso and Americano Rosso, a bitter and an aperitif. The flavours were incredible, each having their own individual taste and uniqueness. Just a few tasting notes for you, so you can see how different the ingredients are for each of the Contratto products. Up first was the Contratto Vermouth Bianco, which had flavours of coriander seeds, cinnamon, nutmeg, bitter orange peel, sage, sweet orange peel, liquorice roots and many more….the list is endless! Next we tried the Contratto Americano Rosso Vermouth, which had flavours of ginger, mint leaves, hibiscus and hawthorn flower, nettle leaves and bitter and sweet orange peel. The final vermouth we tasted was the Contratto Rosso, which had flavours of hawthorn flowers, coriander seeds, marjoram leaves, chamomile leaves, aloe juice, cinnamon, mint leaves and ginger roots. After the vermouth’s, it was on to the Contratto Bitter and Aperitif. The original recipe for Contratto Bitter dates back to 1933 and is based on a mixture of delicately infused, premium natural herbs, spices, roots and seeds combined with Italian Brandy. Flavours include cardamon, enula bell, swertia, nettle and bitter and sweet orange peel. Last but not least was the Contratto Aperitif, it had flavours of tangerine peel, juniper berries, rhubarb, ginger and wormwood. This complex yet well-balanced boutique aperitif is capable of turning any aperitif based cocktail into a wonderful experience. I’d recommend that if you haven’t sampled these products before, you definitely need to now…. delicious! Once the masterclass had finished there was just enough time for a quick break before the cocktail competition started at 3.30pm. 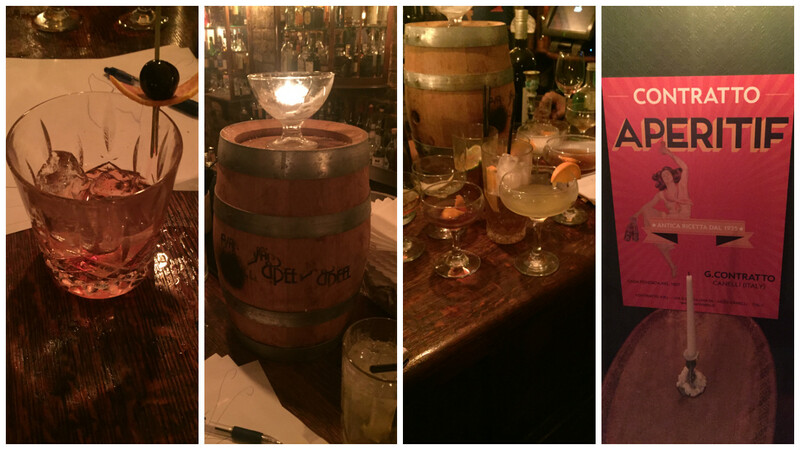 So, similar to other cocktail competitions we’ve hosted, each bartender had to come up with cocktails on the spot. 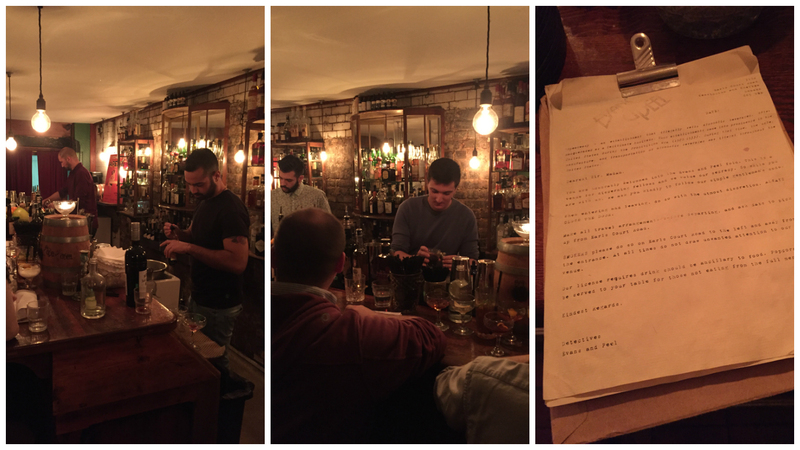 They could enter as many drinks as they liked and were judged purely on taste alone – not presentation. To make it a bit different this time round, as well as having the use of all the Contratto products, we selected a range of additional spirits the bartenders were allowed to use. These included a bottle of Rives Special Gin, Rhum Clément Blanc, Château de Laubade Armagnac, 1615 Acholado Pisco and Pierde Almas Mezcal. 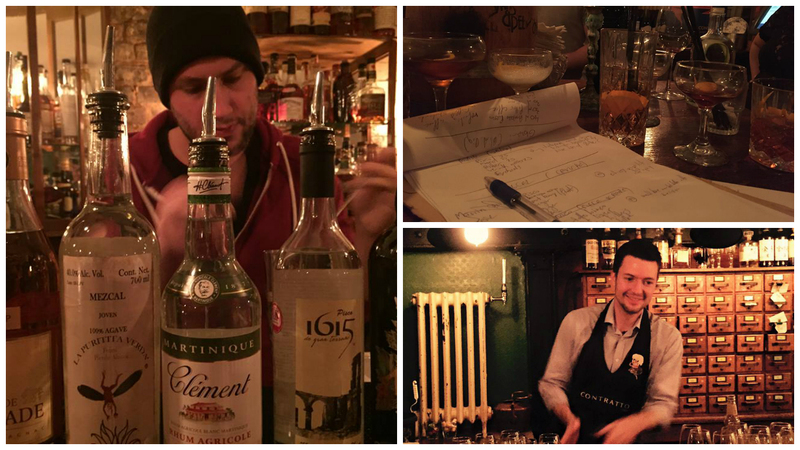 The ones to impress and judging the competition were Nick Bell (Amathus Retail Manager), Anja Cramer (owner of Contratto distillery) and Simon Epale (Bar member at Evans and Peel). The winning prize was a trip to Italy, home of Contratto, and all runners up received a bottle from the Contratto collection. Oh and a Contratto apron too!! In third place was Csaba Toth from Oblix Restuarant. Congratulations Csaba! 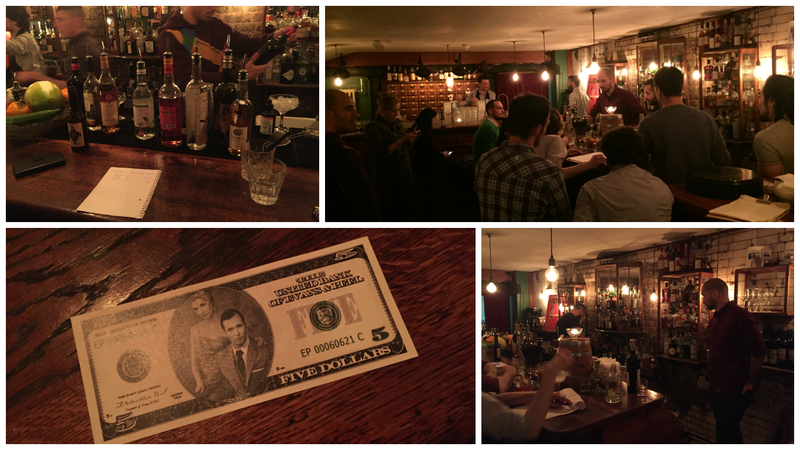 In second place was Giovanni Graiadei from The Blind Pig at Social Eating House. Congratulations Giovanni! and in, first place and the lucky winner of the trip to Italy was……. Filippo Brunelli from Ceviche in Soho. He stole the show with his signature cocktail made up of Contratto Fernet, 1615 Pisco Acholado, lime juice, ginger ale and Angostura Bitters. I’d just like to say a big thank you to Anja Cramer for hosting the Contratto masterclass and judging the cocktail competition. 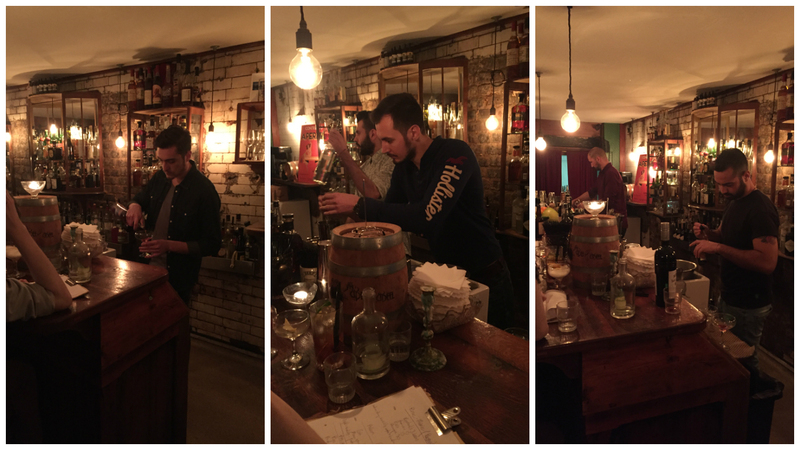 Thank you to our 2 other judges, Nick and Simon, well done boys and finally a huge thank you to Evans and Peel for letting us host the event at your amazing bar. For more information on upcoming events, please visit our blog. < Previous Coming soon to Amathus..